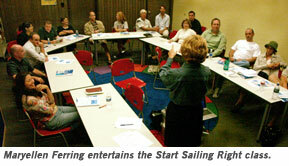 The Smallboat Level 1 Sailing Instructor Certification Course prepares instructors for ASF teaching. Topics covered in the course include: classroom and on-the-water teaching techniques, risk management, safety, lesson planning, creative activities, ethics, and sports physiology and psychology. 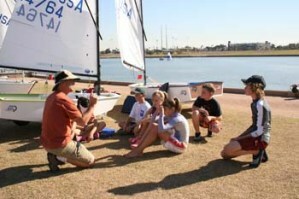 Besides preparing you to teach sailing, it’s guaranteed to sharpen your sailing skills. The dates of the next class have not be chosen. Sign-ups for this class are handled by US Sailing. When dates are set, please visit their page here. This is a 4-day, 40-hour course. Attendance at all course sessions is mandatory. Absence from any portion of the course excludes the instructor candidate from evaluation. It’s a rigorous course, but we haven’t lost anybody yet! All candidates must have reached their 16th birthdays within the calendar year that the course is being held. Students under 18 years of age who complete the course will be designated as a Sailing Assistant until their 18th birthdays. There are a series of prerequisites for this course. Please review them online at the US Sailing website.